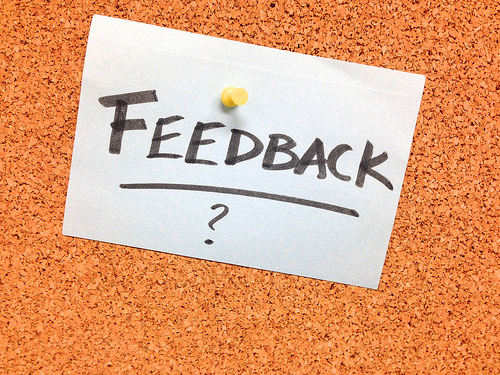 Feedback on your performance at university comes in many forms – it could be something as simple as your tutor nodding in agreement when you make a point in seminar discussion, responses from your classmates when you give a presentation, or the score from an online quiz. Most often, we tend to think about ‘feedback’ as the comments markers give on written work and/or the descriptors in marking rubrics or grids. This post will focus on how you can get the most benefit from feedback on your written work. Whatever form it takes, feedback is most useful when you use it to develop your learning and improve your performance in the future. Usually markers will provide a mixture of feedback and ‘feed forward’. 1. Be sure to look at your feedback. 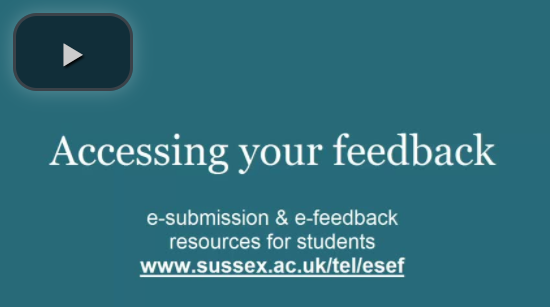 If you have submitted your work online, you can access your feedback via Study Direct and / or Sussex Direct. If your work was submitted manually, make sure you know where and when you can collect your marked work – your School Office will be able to help you. You can also find guidance on viewing your feedback in Turnitin and understanding Turnitin similarity on our e-submission and feedback guidance for students webpages. 2. Think about what your mark means. Most assignments will be marked against assessment criteria, which will be published in advance. A mark in a particular grade band will correspond to a description of the strengths of the work and indicate areas to develop. 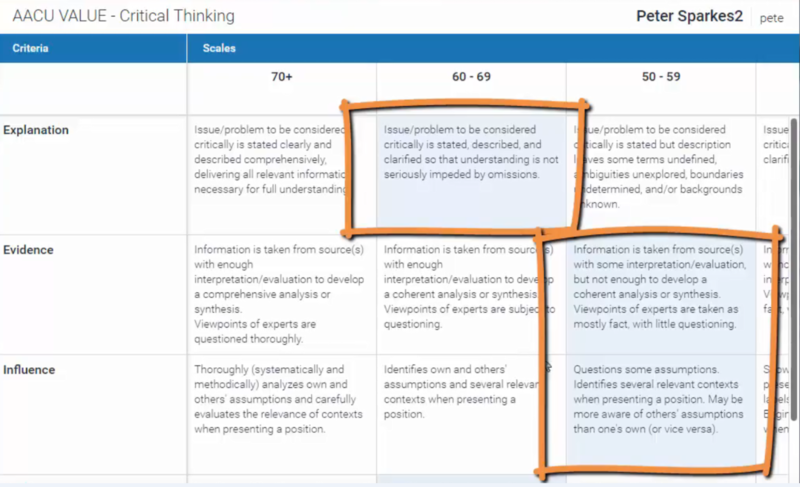 If your assignment was submitted through Turnitin the assessment criteria might be displayed in a rubric indicating how well your work met each of the criteria. You can see rubric feedback by clicking on the ‘View Rubric’ button. You can then see the comments that relate to each of the criteria as in this example. Example of rubric feedback – the highlighted blocks relate to this piece of work. To get some tips for improving your work, look at the descriptors for the higher grades and think about how you could reach those in future. These could be comments in the margins, or on a rubric / grading form. You might have been given audio feedback, so look out for that and listen to it carefully. It is a good idea to make some notes from your feedback, especially noting down the things you did well and aspects that you want to work on for future assignments. If you have any questions about your feedback, arrange to meet with your tutor or Academic Advisor to discuss it. They will be pleased to offer you advice on how you can improve your understanding and written work. There is also lots of excellent general advice on the Skills Hub to help you with writing and assessment. If you want to focus on your writing, the Royal Literary Fund Writers-in-Residence in the Library offer free one-to-one tutorials. International students or those for whom English is a second or additional language can access English language and study skills support provided by the Sussex Centre for Language Studies (SCLS). Before you start work on your next assignment, look back at the notes you made on your feedback (see 3 above) and any notes from meetings with a tutor or from the other resources mentioned in section 4. Don’t forget those important assessment criteria – they describe the characteristics of good work and are an excellent guide as you start planning your writing. Students can find more advice on writing and assessment on the Skills Hub. Staff marking e-submissions might find this previous post on ‘Constructively aligning criterion feedback using Turnitin’ useful, and can contact tel@sussex.ac.uk to discuss ways to enhance feedback.